CONFESSION AND THE LORD'S SUPPER. A sermon by Martin Luther published in eight editions in 1524-1525. I. OF CONFESSION AND THE LORD'S SUPPER IN GENERAL. 1. Although I have often preached and written on the Lord's Supper and Confession, yet annually the time appointed for the consideration of these subjects, for the sake of those who desire to commune, returns, and so we must review them in a summary and speak of them once more. 2. In the first place, I have often enough said that Christians are not obliged to commune on this particular festive day, but that they have the right and authority to come whenever they desire; for God established the office of the ministers for the purpose that they might at all times serve the people and provide them with God's Word and the Sacraments. Therefore it is unchristian to force people under pain of committing mortal sin to commune just at this time; as has been done heretofore, and is still done in many places. For it is not and can not be in keeping with the Lord's Supper to force or compel any one to partake of it; on the contrary, it is intended only for a hungry soul that compels itself and rejoices in being permitted to come; those who must be driven are not desired. 3. Therefore, until the present the devil has ruled with unrestrained power and authority through the pope, compelling him to drive and force the whole world to commune; and in fact, everybody did come running, like swine, because of the pope's command. In this way so much dishonor and shame have been brought upon the Lord's Supper, and the world has been so filled with sin that one is moved with compassion to think of it. But since we know these things we ought to let no command bind us, but to hold fast the liberty wherewith Christ has made us free. I say this for the sake of those will not commune except at this time of the year, and who come only because of the custom and the common practice. There is, to be sure, no harm in coming at this Easter-festival, if only the conscience be free and not bound to the time, and is properly prepared to receive the Lord's Supper. 4. In the second place, we must say the same thing concerning Confession. First of all we know that the Scriptures speak of three kinds of confession. The first is that which is made to God, of which the prophet David speaks in Ps 32, 5: "I acknowledged my sin unto thee, and my iniquity did I not hide: I said, I will confess my transgressions unto Jehovah; and thou forgavest the iniquity of my sin." Likewise, in the preceding third verse David says: "When I kept silence, my bones wasted away as with the drought of summer;" that is, before God no one is able to stand unless he come with this confession, as Ps 130, 4 declares: "But there is forgiveness with thee, that thou mayest be feared;" that is, whoever would deal with thee must deal so that this confession proceeds from his heart, which says: Lord, if thou be not merciful all is lost, no matter how pious I may be. Every saint must make this confession, as again we read in the Psalm mentioned, verse 6, "For this let everyone that is godly pray unto thee." Therefore, this kind of confession teaches us that we are all alike wicked and sinners, as the saying is, If one of us is good, all of us are good. If anyone have special grace, let him thank God and refrain from boasting. Has anyone fallen into sin, it is because of his flesh and blood; nor has any fallen so low but that another who now stands may fall even lower. Therefore, as far as we are concerned, there is no difference among us, the grace of God alone is dividing us. 5. This kind of confession is so highly necessary that it dare not cease for a moment, but must constitute the entire life of a Christian, so that without ceasing he praise the grace of God and reproach his own life in the eyes of God. Otherwise, if he dare to plead some good work or a good life before God, his judgment, which can tolerate nothing of the kind, would follow; and no one is able to stand before it. Therefore, this kind of confession must be made, that you may condemn yourself as worthy of death and the fire of hell; thus you will anticipate God so that he will not be able to judge and condemn you, but must show you mercy. Concerning this kind of confession, however, we will not speak at this time. 6. The second kind of confession is that made to our neighbor, and is called the confession springing from love, as the other is called the confession springing from faith. Concerning this kind of confession we read in Ja 5, 16: "Confess therefore your sins one to another." In this confession, whenever we have wronged our neighbor, we are to acknowledge our fault to him, as Christ declares in Mt 5, 23-25: "If therefore thou art offering thy gift at the altar, and there rememberest that thy brother hath aught against thee, leave there thy gift before the altar, and go thy way, first be reconciled to thy brother, and then come and offer thy gift. Agree with thine adversary quickly, while thou art with him in the way etc." God here requires of both parties that he who hath offended the other ask forgiveness, and that he who is asked grant it. This kind of confession, like the former, is necessary and commanded; for God will be merciful to no one, nor forgive his sins, unless he also forgive his neighbor. In like manner, faith cannot be true unless it produce this fruit, that you forgive your neighbor, and that you ask for forgiveness; otherwise a man dare not appear before God. If this fruit is absent, faith and the first kind of confession are not honest. 7. The third kind of confession is that ordered by the pope, which is privately spoken into the ears of the priest when sins are enumerated. This confession is not commanded by God; the pope, however, has forced the people to it and, in addition, has invented so many kinds and varieties of sin that no one is able to keep them in mind; thus consciences have been troubled and tortured in a manner that is pitiful and distressing. Concerning this, however, we will say that God does not force you to confess by faith to him, or by love to your neighbor, when you have no desire to be saved and to receive his grace. Neither does he want you to make confession against your will and desire; on the contrary, he wants you to confess of your own accord, heartily, with love and pleasure. In like manner, he does not compel you to make a private confession to the priest when you have no desire of your own to do so, and do not long for absolution. This the pope disregarded, and proceeded as though it were a part of the civil government requiring that force be employed; he did not inquire whether a person felt willing or not, but he simply issued the order, that whosoever does not confess at this time shall not have burial in the cemetery. But God cares not whether a thing is done or not, as long as it is not done with pleasure. It is better, therefore, to postpone a duty than to perform it unwillingly. For no one can come to God unless he come gladly and of his own free will; hence, no one can compel you to come. If you come because of the command and in order to show obedience to the pope, you do wrong. Yet it is the custom in the whole world that everybody runs to the Lord's Supper solely because it is commanded; hence this is very properly called the week of torture, since in it the consciences of the people are tortured and tormented so that they are really to be pitied, besides the injury and destruction of souls. Moreover, Christ himself is also tortured far more shamefully than when he hung upon the cross. Therefore, we may well lift up our hands and thank God for giving us such light. For although we do not bear much fruit and amend, still we have the right knowledge. Hence, it is much better to stay away from confession and communion than to go unwillingly: then at least our consciences remain untortured. 8. Hence we say of private confession, that no one is compelled to observe it. Still it is for this reason a commendable and good thing. Wherever and whenever you are able to hear God's Word you ought not to despise it, but receive it with heartfelt desire. Now, God has caused his Word to go forth through all the world, so that it fills every nook and corner, and wherever you go you find God's Word. If I preach the forgiveness of sins, I preach the true Gospel. For the sum of the Gospel is: Whosoever believeth in Christ shall receive the forgiveness of his sins. Thus a Christian preacher cannot open his mouth unless he pronounces an absolution. Christ also does the same in the Gospel lesson when he says, "Pax vobiscum," Peace be unto you. That is, I proclaim unto you, as of God, that you have peace and forgiveness of sins; this is even the Gospel itself, and absolution. So also the words of the Lord's Supper, "This is my body which is given for you; this is my blood which is shed for you for the remission of sins etc." If I were to say, I will not go to confession because I have the Word in the Lord's Supper, I will be like him who declares, Neither am I going to hear the preaching. The Gospel must ring and echo without ceasing in every Christian's mouth. Therefore we are to accept it with joy wherever and whenever we can hear it, lift up our hands, and thank God that we can hear it everywhere. 9. Therefore, when you go to private confession give more heed to the priest's word than to your own confessing; and make this distinction, What you say is one thing, and what he says who hears you is another. Do not place much value on what you do, but give heed to what he says, to wit, that in God's stead he proclaims to you the forgiveness of sins. It makes no difference whatever whether he be a priest, called to preach, or merely a Christian. The word which he speaks is not his, but God's Word; and God will keep it as surely as if he had spoken it. This is the way he has placed his holy Word into every corner of the world. Since, therefore, we find it everywhere, we ought to receive it with great thankfulness, and not cast it to the winds. 10. For in Confession as in the Lord's Supper you have the additional advantage, that the Word is applied to your person alone. For in preaching it flies out into the whole congregation, and although it strikes you also, yet you are not so sure of it; but here it does not apply to anyone except to you. Ought it not to fill your heart with joy to know a place where God is ready to speak to you personally? Yea, if we had a chance to hear an angel speak we would surely run to the ends of the earth. Are we not then foolish, wretched and ungrateful people not to listen to what is told us? Here the Scriptures stand, and testify that God speaks through us, and that this is as valid as though he were to speak it with his own mouth; even as Christ declares in Mt 18, 20, "Where two or three are gathered together in my name, there am I in the midst of them;" again in Jn 20,23, "Whose soever sins ye forgive, they are forgiven unto them; whose soever sins ye retain, they are retained." Here God himself pronounces the absolution, just as he himself baptizes the child; and do you say we don't need Confession? For although you hear the same thing in the Lord's Supper you ought not on that account to reject it, especially since it applies to you, as already stated, personally. 11. Besides this you have another advantage, in Confession you are enabled to disclose all your failings, and to obtain counsel regarding them. And if there were no other reason, and God did not himself speak in Confession, I would not willingly give it up for this one reason, that here I am permitted to open my heart to my brother and tell him what troubles me. For it is a deplorable thing to have the conscience burdened and prostrate with fear, and to know neither counsel nor consolation. This is why it is such an excellent and comforting thing for two to come together, and the one to offer advice, help and consolation to the other, proceeding in a fine brotherly and affectionate manner. The one reveals his ailment; whereupon the other heals his wounds. Therefore I would not give Confession up for all the treasure of the world. Still it dare not be made a command, lest it be turned into a matter of conscience, as though a person would not dare to commune without first making confession; nevertheless, we ought never to despise Confession, you cannot hear God's Word too frequently, nor impress it so deeply upon your heart that it could not be done still better. 12. Therefore I said that confession and absolution must be carefully distinguished from each other, that you give attention chiefly to the absolution, and that you attend confession not because of the command, or in order to do a good work by your confessing, thinking that because of this good work your sins are forgiven; on the contrary, we are to go only because we there hear God's Word and by it receive consolation. To this incline your ears, and be persuaded that God speaks through men and forgives you your sins; this, of course, requires faith. Hitherto the manner of our Confession was as follows: when people were absolved so many works were required of them as to render satisfaction for their sins. This was called absolving, whereas in truth it meant binding worse than ever. Sins ought to be completely removed by the absolution; but they first imposed the task of rendering satisfaction for them, and thus force people away from faith and absolution, and induce them to rely upon their own works. They should be taught thus, Behold, this word which I speak to you in God's stead you must embrace in true faith. If you have not this faith postpone your confession; yet this does not mean that when your faith is too weak you are not to come and demand consolation and strength. If you cannot believe, tell the brother to whom you would confess of it, and say to him, I do indeed feel that I have need of confession and absolution, but I find I am too cold and too weak in faith. For to whom are you going to confide your weakness if not to God? And where can you find him except in your brother? He can strengthen and help you by his words. This is confessing in the right way; and would to God the whole world were brought far enough at least for everyone to confess that he cannot believe. 13. Let it be said now concerning Confession that everything ought to be free, so that each person attends without constraint, of his own accord. But what ought one to confess? Here is where our preachers in the past have pounded a great deal into us by means of the five senses, the seven deadly sins, the ten commandments, etc., thereby perplexing our consciences. But it should be, that you first of all feel that which weighs you down, and the sins that pain you most and burden your conscience you ought to declare and confess to your brother. Then you need not search long nor seek all kinds of sins; just take the ones that come to your mind, and say, This is how frail I am and how I have fallen; this is where I crave consolation and counsel. For confession ought to be brief. If you recall something that you have forgotten, it is not to trouble you; for you confessed not in order to do a good work, or because you were compelled, but in order to be comforted by the word of absolution. Moreover, you can easily confess to God in secret what was forgotten, or you can hear the absolution for it during the communion service. We are therefore not to worry even if sins have been forgotten; though forgotten they are still forgiven; for God looks, not to the excellence or completeness of your confession, but to his Word and how you believe it. So also the absolution does not state that some sins are forgiven and others not; on the contrary, it is a free proclamation declaring that God is merciful to you. But it God is merciful to you all your sins must be blotted out. Therefore, hold fast to the absolution alone and not to your confession; whether or not you have forgotten anything makes no difference; as much as you believe so much are you forgiven. This is the way we must ever trust in God's Word in spite of sin and an evil conscience. III. OF THE LORD'S SUPPER. 14. In the third place we must speak of the Lord's Supper. We said above that no one should be compelled to commune at any special time, but that this should be left free. It remains for us to speak of the two elements in the Lord's Supper. I have already said that among us one element alone is not to be offered to the communicant; he who wants the Lord's Supper should receive the whole of it. For we have preached and practiced this long enough and cannot assume that there should be anyone unable to understand it; yet if there be one so dense, or claiming to be so weak that he cannot grasp the true meaning of it, we will excuse him; it is just as well that he remains away. For anyone to hear God's Word so long, to have himself coddled like a child, and after all to continue saying, I do not understand, is no good sign. For it is impossible for you to hear so long and still be unenlightened; since then you remain blind it is better for you not to receive the Lord's Supper. If you cannot grasp the Word that is bright, clear and certain, you need not grasp the sacrament; for the sacrament would be nothing if there were no Word. Moreover, this Word has now resounded again and again throughout the whole world, so that even they who oppose it know it. These, however, are not weak but obdurate and hardened; they set their heads against the doctrine they hear us prove from the Scriptures with such clearness that they are unable to reply or establish the contrary; yet they simply remain in the Romish Church and try to force us to follow them. Therefore, it is out of the question for us any longer to yield or to endure them, since they defy us and maintain as their right what they teach and practice. Hence we wish to receive both elements in the Lord's Supper, just because they wish to prevent us from having them. The thought of causing offense no longer applies to those people. But if there were a locality where the Gospel had not been heard, it would be proper and Christian to adapt one's self for a time to those who are weak; as also we did in the beginning when our cause was entirely new. Now, however, since so much opposition is offered, and so many efforts at violent suppression are made, forbearance is out of the question. 15. It is, moreover, a fine example of God's providential ruling and guidance that the Lord's Supper is not devoid of persecution, for in instituting it he intended it to be a token and mark whereby we might be identified as Christians. For if we were without it, it would be impossible to tell where to find Christians, and who are Christians, and where the Gospel has borne fruit. But when we go to the Lord's Supper people can see who they are that have heard the Gospel; moreover, they can observe whether we lead Christian lives. So this is a distinctive mark whereby we are recognized, whereby we also confess the name of God and show that we are not ashamed of his Word. When now the pope sees me going to the Lord's Supper and receiving both elements, the bread and the wine, according to the Gospel, it is a testimony that I am determined to cling to the Gospel. If then he grows angry and endeavors to slay me, it is just as it was in the early days of Christianity when the Christians confessed God in the same way by this token of the Lord's Supper. 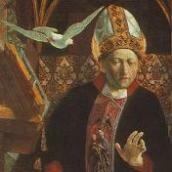 Our bishops have forbidden both elements as contrary to God's ordinance and command. If now we mean to confess Christ we must receive both elements, so that people may know that we are Christians and abide by the Word of God. If for this cause they slay us we ought to bear it, knowing that God will abundantly restore life to us again. Hence it is proper for us to suffer persecution on this account; otherwise, if everything were to go smoothly, there would be no real confession. In this way we remain in the right state, always expecting shame and disgrace, yea, even death for the Lord's sake, as it was in the ancient church. "Our Lord Jesus Christ, the same night in which he was betrayed, took bread; and when he had given thanks. he broke it and gave it to his disciples and said, Take, eat; this is my body which is given for you: this do in remembrance of me." "After the same manner also he took the cap, when he had supped, gave thanks and gave it to them, saying: Take, drink ye all of it; this cup is the New Testament in my blood, which is shed for you for the remission of sins: this do ye, as oft as ye drink it, in remembrance of me." 17. These are the words which neither our opponents nor Satan are able to deny, on them we must stand. Let them make whatever comments they please; we have the clear Word of God, saying, the bread is Christ's body given for us; and the cup his blood shed for us. This he bids us do in remembrance of him; but the pope commands that it be not done. Well, they say, we are only erring laymen, we do not understand, nor are we able to explain the words. But we reply: it is for us to explain just as much as it is for them; for we are commanded to believe in Christ, to confess our faith, and to keep all the commandments of God, just as well as they are. For we have the same God they claim to have. How then are we to believe without knowing and understanding his Word? Since I am commanded to believe I must know the words I am to believe; for how can I believe without the words? Moreover, it is my duty to stand firm, and I must know how to defend myself and how to refute the arguments to the contrary. This is how you can stop their mouths and bring them to silence. My faith must be as good as yours, therefore I must have and must know the Word as well as you. For example the Evangelist here says, "Jesus took the cup and gave it to his disciples, saying, Drink ye all of it; this is my blood of the New Testament which is shed for you," etc. These words are certainly clear enough; and there is no one so stupid that he cannot understand what is meant by, "Take, drink ye all of it; this is the cup of the New Testament in my blood" etc. Therefore we reply, Unless they prove to us that drinking here signifies something different from what all the world understands by the term, we shall stick to the interpretation, that we are all to drink of the cup. Let them bring forward what they please, custom or councils, we reply, God is older and greater than all things. 18. Likewise, the words are clear, "This do in remembrance of me." Tell me, who is to remember the Lord? Is this said to the priests alone, and not to all Christians? And to remember the Lord, what is that but to preach him and to confess him? Now if we are all to remember the Lord in his Supper we must certainly be permitted to receive both elements, to eat the bread and to drink the cup; this surely no one can deny. Therefore, there is no use for you to cover up these words and tell us that we are not to know them. If we are not to know them, what are you here for? You claim to be a shepherd, and therefore you ought to be here to teach these words and preach them to me, and now by your own rotten defense you are forced to confess your own shame and bite your own tongue, having so shamefully spoken in contradiction of the truth. 19. Thus you see how we are to understand the words of the institution of the Lord's Supper and firmly hold to them; for in them all the virtue is centered, we all must know them, understand them, and cling to them in faith, so as to be able to defend ourselves and to repulse the foe. When you wish to go to the Lord's Supper listen to the words spoken, and be assured that they contain the whole treasure on which you are to stand and rely, for they are really spoken to you. My body is given, my blood is shed, Christ declares. Why? Just for you to eat and drink? No; but for the remission of sins. This is what strikes you; and everything else that is done and said has no other purpose than that your sins may be forgiven. But if it is to serve for the forgiveness of sins, it must be able also to overcome death. For where sin is gone, there death is gone, and hell besides; where these are gone, all sorrow is gone and all blessedness has come. Therefore, you must act so that the words mean you. This will be when you feel the sting and terror of your sin, the assault of the flesh, the world, and the devil. At one time you are angry and impatient; at another you are assailed by the love of money and the cares of life, etc. ; so that you are constantly attacked, and at times even gross sins arise, and you fall and injure your soul. Thus you are a poor and wretched creature, afraid of death, despondent, and unable to be happy. Then it is time, and you have reason enough to go, make confession, and confide your distress to God, saying, Lord, thou has instituted and left us the sacrament of thy body and blood that in it we may find the forgiveness of sin. I now feel that I need it. I have fallen into sin. I am full of fear and despair. I am not bold to confess thy Word. I have all these failings, and these. Therefore, I come now that thou mayest heal, comfort, and strengthen me etc. 21. For this reason I made the statement that the Lord' Supper is to be given only to him who is able to say that this is his condition; that is, he must state what troubles him, and must long to obtain strength and consolation by means of the Word and the symbol. Let him who is unable to use the Lord's Supper in this way remain away, nor let him do like those who wretchedly torture themselves at this time, when they come to the sacrament, and have no idea what they are doing. Now when you receive the Lord's Supper, go forth and exercise your faith. The sacrament serves to the end that you may be able to say, I have the public declaration that my sins are forgiven; besides my mouth has received the public symbol, this I can testify, as also I have testified before the devil and all the world. When death now and an evil conscience assail you, you can rely on this and defy the devil and sin, and thus strengthen your faith and gladden your conscience towards God, and amend your life day by day, where otherwise you would be slothful and cold, and the longer you remained away the more unfit you would be. But if you feel that you are unfit, weak and lacking, where will you obtain strength here? Do you mean to wait until you have grown pure and strong, then indeed you will never come and you will never obtain any benefit from the holy communion. 22. This is the right use of the Lord's Supper, serving not to torture, but to comfort and gladden the conscience. For by instituting it for us, God did not intend it to be poison and torture to frighten us; this is what we made of it by our false doctrine, when we imagined we were to bring the offering of our piety to God, and hid the words that were to give comfort and salvation, strengthen our consciences, refresh, gladden and free them from every distress. This is the meaning of the Lord's Supper, and we are to look upon it only as containing sweet grace, consolation, and life. It is poison and death to those who approach it with insolence, who feel no weakness, frailty, or distress to impel them, who act as if they were pure and pious from the start. The Lord's Supper welcomes those who perceive their frailties and feel that they are not pious, yet would like to be. Thus it all depends on this feeling, for we are all frail and sinful, only we do not all confess it. 23. Let this suffice on how we ought to prepare ourselves to receive the communion and conduct ourselves toward it, namely, that we are to exercise and strengthen our faith by the words of the institution of the Supper which say that Christ's body and blood are given and shed for the remission of sins. These words sufficiently show the benefit, fruit and use of the Lord's Supper as far as partaking of it for ourselves is concerned. But the second thought springing from the first is Christian love, and this also deserves attention. It is our duty to let the benefit and fruit of the Lord's Supper become manifest, and we ought to show that we have received it with profit. We at present see it received throughout all the world in so many celebrations of the mass, but where do you see the least fruit following from it? 24. Now this is the fruit, that even as we have eaten and drunk the body and blood of Christ the Lord, we in turn permit ourselves to be eaten and drunk, and say the same words to our neighbor, Take, eat and drink; and this by no means in jest, but in all seriousness, meaning to offer yourself with all your life, even as Christ did with all that he had, in the sacramental words. As if to say, Here am I myself, given for you, and this treasure do I give to you; what I have you shall have; when you are in want, then will I also be in want; here, take my righteousness, life, and salvation, that neither sin, nor death, nor hell, nor any sorrow may overcome you; as long as I am righteous and alive, so long shall you also be righteous and alive. These are the words he speaks to us; these we must take, and repeat them to our neighbor, not by the mouth alone, but by our actions, saying, Behold, my dear brother, I have received my Lord; he is mine, and I have more than enough and great abundance. Now you take what I have, it shall be yours, and I place it at your disposal. Is it necessary for me to die for you, I will even do that. The goal placed before us in the Lord's Supper is that the attainment of such conduct toward our neighbor may appear in us. 25. Of course, it is true, we will not become so perfect that one places his soul and body, goods and honor at the disposal of the other. We still live in the flesh, and this is so deeply rooted in us that we are unable to furnish this symbol and evidence as perfectly as we should. On account of these our shortcomings Christ has instituted the Lord's Supper for our training, that here we may obtain what we lack. For what will you do when you miss in yourself what we have described? You must even come and tell him, Behold, this is what I need. Thou dost give thyself to me so richly and abundantly, but I am unable to do likewise toward my neighbor; this I lament before thee, and I pray thee, let me grow rich and strong enough to accomplish it. Though it is impossible for us to reach such perfection, we are nevertheless to sigh for it, and not to despair when we fall short, only so the desire to obtain it continue in our hearts. 26. Yet the least part of love and devotion is not the sacrifice of my pride. I can indeed give my neighbor temporal goods and bodily service by my efforts and labor; I can also render him service by offering instruction and intercession; likewise I can visit and comfort him when he is sick and in sorrow, feed him when hungry, loose him when bound, etc. But to bear my neighbor's weakness is far greater than all these. Yet with us the trouble will always be that we will not be able to do it as perfectly as Christ did. He is the bright, radiant sun without a single shadow, whereas our light, compared with this sun, is only a gleaming bit of lighted straw. Yonder a glowing oven full of fire and perfect love; and he is satisfied if we light only a little taper and endeavor somewhat to let love shine forth and burn. This is the shortcoming we all see and feel in each other. But never let anyone conclude and say, This is not Christ. On the contrary, see what he did in the Gospel story when so often he suffered his disciples to stray and stumble, making his wisdom yield and serve their folly. He condemns them not, but endures their weakness and tells them in Jn 13,7-33: "Whither I go, ye cannot come." Likewise, to Peter, "What I do, thou knowest not now." By such love he abandons his righteousness, judgment, power, vengeance, and punishment, and his authority over us and our sins. He could indeed condemn us for our folly, but all he does is to say, You do wrong, you do not know; yet casts us not away, but comforts us. Therefore I said, it is no small evidence of love to be able to bear with one's neighbor when he is weak in faith or in love. 27. On the other hand, Christ dealing so kindly with his disciples is no permission for us to approve of human weaknesses or of sin. For later he tells Peter, "What I do thou shalt understand hereafter." Here he merely gives his weakness time and bears with it. It is as though he said, I will bear with your ignorance and weak faith for your sake and will spare you as long as you understand that you must do better, and intend to later on; not that you may grow idle and secure. 28. Therefore, when we have received the Lord's Supper we must not allow ourselves to become indolent, but must be diligent and attentive to increase in love, aid our neighbor in distress, and lend him a helping hand when he suffers affliction and requires assistance. When you fail to do this you are not a Christian, or only a weak Christian, though you boast of having received the Lord and all that he is, in the Lord's Supper. 29. If, however, you would be sure of partaking profitably of the Lord's Supper, there is no better way than to observe your conduct toward your neighbor. You need not reflect on the great devoutness you experienced, or on the sweetness of the words in your heart. These indeed are good thoughts, but they will not give you assurance, they may deceive you. However, you will be sure as to whether the sacrament is efficacious in your heart, if you watch your conduct toward your neighbor. If you discover that the words and the symbol soften and move you to be friendly to your enemy, to take an interest in your neighbor's welfare, and to help him bear his suffering and affliction, then it is well. On the other hand, if you do not find it so, you continue uncertain even if you were to commune a hundred times a day with devotions so great as to move you to tears for very joy; for wonderful devotions like this, very sweet to experience, yet as dangerous as sweet, amount to nothing before God. Therefore we must above all be certain for ourselves, as Peter writes in 2 Pet. 1, 10, "Give the more diligence to make your calling and election sure." The Word and the sacrament are indeed certain in themselves; for God himself, together with all the angels and saints, testify to this; the question is in regard to yourself whether you furnish the same testimony. Therefore, even if all the angels and the whole world were to testify that you had received the Lord's Supper profitably, it would be weaker testimony than that furnished by yourself. This you cannot reach unless you consider your conduct whether it shines forth, works in you, and bears fruit. 30. Now when fruit fails to appear, when you feel that constantly you remain just as you were, and when you care nothing for your neighbor, then you have reason to take a different attitude in these things; for this is no good sign. Even Peter had to hear the same who was godly and ready to die and to do wonderful deeds for Christ. What then will you do? If you still experience evil desires, anger, impatience etc., you are again in trouble and that should urge and impel you to go to Christ and lay it before him, saying. I partake of the Lord's Supper, still I remain as I was, without fruit. I have received the great treasure, yet it remains inactive and dormant within me: This I lament before thee., As thou hast bestowed this treasure upon me, grant now that it may also produce fruit and a new life within me, manifesting themselves toward my neighbor. Now when you begin a little to prove this, you will continually grow stronger and break forth in good deeds to your neighbor more from day to day. 31. For this life is nothing more than a life of faith, of love, and of sanctified affliction. But these three will never be perfect in us while we live here on earth, and no one possesses them in perfection except Christ. He is the sun and is set for our example, which we must imitate. For this reason there will always be found among us some that are weak, others that are strong, and again some that are stronger; these are able to suffer less, those more; and so they must all continue in the imitation of Christ. For this life is a constant progress from faith to faith, from love to love, from patience to patience, and from affliction to affliction. It is not righteousness, but justification; not purity, but purification; we have not yet arrived at our destination, but we are all on the road, and some are farther advanced than others. God is satisfied to find us busy at work and full of determination. When he is ready he will come quickly, strengthen faith and love, and in an instant take us from this life to heaven. But while we live on earth we must bear with one another, as Christ also bore with us, seeing that none of us is perfect. 32. Christ has shown this to us not only by his own example and by his Word, but he has also pictured it to us in the form of the Sacrament of the Altar, namely, by means of the bread and the wine. We believe that the true body and blood of Christ is under the bread and wine, even as it is. Here we see one thing and believe another, which describes faith. For when we hear the Word and receive the Lord's Supper we have merely a word and an act, yet by it we embrace life and every treasure, even God himself. Likewise love is pictured in these signs and elements. First of all in the bread. For as long as the grains of wheat are in a pile before they are ground, each is a body separate for itself, and is not mingled with the others; but when they are ground they all become one body. The same thing takes place with the wine. As long as the berries are not crushed each retains its own form, but when they are crushed they all flow together and become one drink. You cannot say, this is the flour from this grain, or this is a drop from that berry; for each has entered the form of the other, and thus was formed one bread and one drink. This is the interpretation of St. Paul in 1 Cor 10, 17: "Seeing that we, who are many, are one bread, one body: for we all partake of the one bread." We eat the Lord by the faith of the Word which the soul consumes and enjoys. In this way my neighbor also eats me: I give him my goods, body, and life and all that I have, and let him consume and use it in his want. Likewise, I also need my neighbor; I too am poor and afflicted, and suffer him to help and serve me in turn. Thus we are woven one into the other, helping one another even as Christ helped us. This is what it means spiritually to eat and drink one another. 33. Let me say now in conclusion in regard to the Lord's Supper that when we have received it we ought to give heed to love, and in this way assure ourselves that we have received the sacrament profitably, and at the same time furnish evidence to others; so that we may not always come and still continue unchanged. Therefore, as I said, we must turn from our devotions and thoughts to our conduct toward our neighbor, and examine ourselves in this mirror with all seriousness. The sacrament is to act upon us so that we may be transformed and become different people. For God's word and work do not intend to be idle, but are bound to produce great things, to wit, set us free from sin, death, and the devil, and every kind of fear, and make us servants even of the least among men on earth, and this without the slightest complaint on our part, rejoicing rather to find someone in need of our help, and fearing only lest after receiving so much we may not apply it all. 34. Whenever the Lord's Supper fails to produce this result there is reason to fear it has wrought injury. Nevertheless, even if the result is not great, we are not to reject those that are imperfect and weak, but those that are indolent and insolent, who imagine they have done enough when they have partaken of the sacrament. A change must take place in you, and there must be evidence of it, then you will be able to perceive through the symbol that God is with you, and your faith will grow sure and strong. For you can easily feel whether you have grown more joyous and bold than you were before. Formerly the world seemed too narrow for us when we heard of death and thought of sin. If now we feel different it is not because of our own strength, for in the past we could not get so far, although we put forth greater exertions and endeavored to help ourselves by means of works. Likewise, you can feel whether you are kind to him who injured you, and whether you are merciful to him who is sick. Thus you can discover, whether the Lord's Supper is producing any fruit through your own life. If you experience nothing, go to God and tell him of your shortcomings and troubles; we all must do the same thing as long as we live, for, as we have said, not one of us is perfect. For the present let this suffice on this subject.